The present example belongs to a group of finely painted bottles from the Daoguang period which were made in sets for the Court to distribute as gifts. It is decorated with pairs of doves on both sides, although it was not uncommon for some bottles to be painted with doves on one side, and Pekinese dogs on the other. It would appear that the Daoguang Emperor and his consort were fond of doves and small dogs, respectively, so the two subjects were popular on Imperial snuff bottles of the period. According to Geoffrey R. Sayer (Tao Ya or Pottery Refinements, London, 1959, p. 123, no. 722), "Cheng Miao [the Daoguang Emperor] was fond of pigeons; his exalted concubine was fond of little dogs. That is why many of the dishes of the period have pictures of these two creatures." Paired doves, like other paired creatures, suggest conjugal bliss. As a rule, one of the creatures is light and one dark, presumably to mirror the yin/yang balance. This is certainly one of the more effective and successful decorative designs of the Imperial kilns, with the simplicity of the shapes of the doves set against the grassy ground. A Daoguang-marked enameled porcelain bottle with very similar design, from the J & J Collection, was sold in these rooms, 29 March 2006, lot 15. 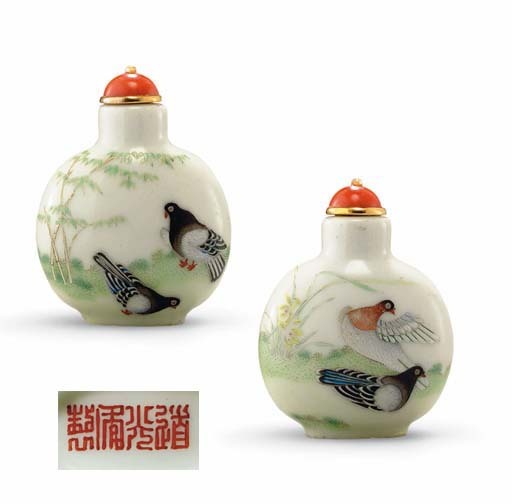 Another example decorated with a pair of doves on one side and a pair of Pekinese dogs on the reverse is in the Palace Museum, Beijing, and is illustrated in Snuff Bottles. The Complete Collection of Treasures of the Palace Museum, p. 227, no. 348.